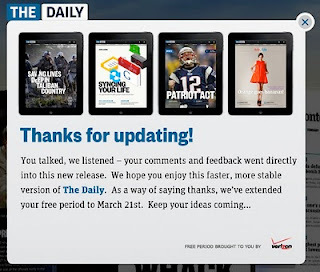 The Daily, the iPad only digital newspaper, has received another extension to it's free preview period. 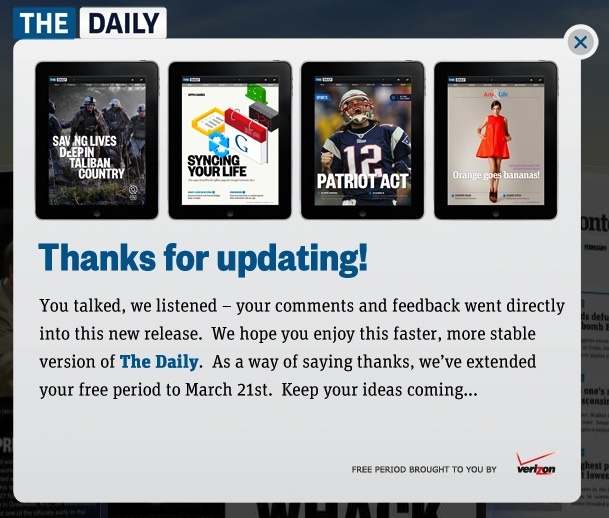 The preview period continues to be sponsored by Verizon and will be free to iPad users until March 21, 2011. Once the preview period for The Daily expires, subscriptions to the new digital newspaper can be subscribed to as an in app purchase of $0.99 per week or $39.99 per year. The Daily, as the name implies, is published 365 days a year. For more information about The Daily, check out The Daily website. Rumor: Hmmm....I wonder when the iPad 2 will begin shipping? The week before, perhaps? Rumor: Is Sprint Talking to Apple About iPhone?